Data security refers to the ability to control application user access to data in an Oracle database throughout all components of an Oracle Enterprise, using a uniform methodology. In Oracle Database Real Application Security, to secure a database table or view, you must specify the rows that you want to secure by creating a data realm (see also, data realm). To restrict access to the data realm, you associate one or more access control lists (ACLs) that list the application users or application roles and their application privileges for each data realm. A data realm together with its associated ACL is known as a data realm constraint. You can further restrict access to specific columns by applying one or more application privileges to each column. This is useful in situations where you want only privileged application users to see the data in that column. Data security is an extension of Oracle Virtual Private Database (VPD). VPD adds a WHERE predicate to restrict data access each time an application user selects or modifies a database table. For more information about VPD, see Oracle Database Security Guide . 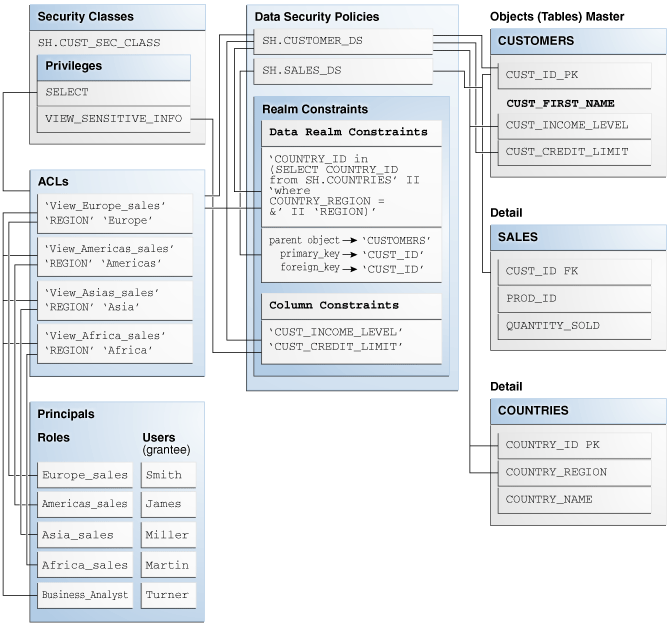 Oracle Database Real Application Security extends VPD concepts further by implementing an authorization model that can further restrict access at both the row and column by means of associating ACLs to these objects. In addition, the application session and session context (through user roles and session namespace) are made more secure. Furthermore Real Application Security provides its own data dictionaries. Create a data security policy. The data security policy defines one or more data realms and associates ACLs for each data realm to create data realm constraints. The data security policy can also contain column-specific attributes to further control data access. Multiple tables or views can share the same data security policy. This lets you create a uniform security strategy that can be used across a set of tables and views. Example 5-1Example 5-1 shows the structure a data security policy. Associate the data security policy with the table or view you want to secure. You can run the XS_DATA_SECURITY.APPLY_OBJECT_POLICY PL/SQL procedure to enable the data security policy for the table or view that contains the data realms and columns that you want to secure. Note that if your application security requires that you update table rows and also restrict read access to certain columns in the same table, you must use two APPLY_OBJECT_POLICY procedures to enforce both data security policies. For example, one APPLY_OBJECT_POLICY procedure would enforce the DML statement_types required for updating table rows (for example, INSERT, UPDATE, DELETE), while the other APPLY_OBJECT_POLICY procedure would enforce only the statement_types of SELECT for the column constraint. Example 5-5Example 5-5 shows how to use the APPLY_OBJECT_POLICY procedure. See "APPLY_OBJECT_POLICY Procedure" for more information. Validate the data security policy. See "About Validating the Data Security Policy" for more information. Oracle recommends that you should always validate the Real Application Security objects after administrative configuration changes. The XS_DIAG package provides a set of validation APIs to help ensure that the complicated relationships among your Real Application Security objects are not damaged unintentionally by these changes. See "VALIDATE_DATA_SECURITY Function" for more information about validating a data security policy. You can create a data security policy using the XS_DATA_SECURITY.CREATE_POLICY PL/SQL procedure. Figure 5-1 shows the structure of a Real Application Security data security policy named HR.EMPLOYEES_DS that is created from a data realm constraint and a column constraint, both of which are to be applied to the EMPLOYEES table. The data realm constraint defines the rows (DEPARTMENT_ID with a value of 60 or 100) on which the data security policy applies and the ACL (HRACL) that is associated with these rows. The column constraint defines a constraint for the sensitive column data in the SALARY column of the EMPLOYEES table by using the VIEW_SENSITIVE_INFO privilege that is required to view this sensitive data. Description of "Figure 5-1 Real Application Security Data Security Policy Created on the EMPLOYEES Table"
Example 5-1 creates the data security policy shown in Figure 5-1. You should validate the data security policy after you create it. See "VALIDATE_DATA_SECURITY Function" for more information. Policy Name: This defines the name of the data security policy. Example 5-1 uses the name EMPLOYEES_DS for the data security policy that it creates. Data Realm Constraints: The data realm constraints define the data realms, or the rows, on which the data security policy applies, together with the ACLs to be associated with these data realms. 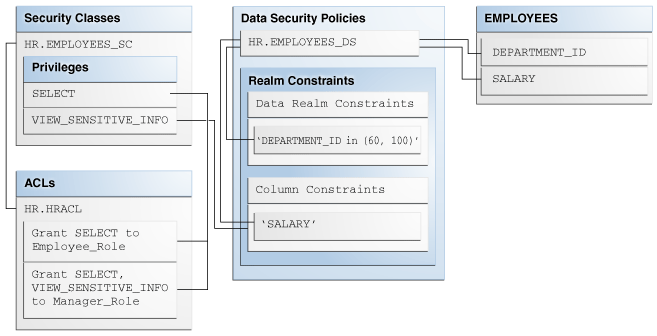 Example 5-1 uses the realm_cons list to define the data realm constraint for the EMPLOYEES_DS policy. realm_cons comprises of rows that have a DEPARTMENT_ID value of 60 or 100. These rows are associated with the HRACL access control list. Column Constraint: Column constraint defines additional constraint for sensitive column data in the data realm constraint. Example 5-1 associates the column_cons column constraint with the EMPLOYEES_DS policy. column_cons protects the SALARY column with the VIEW_SENSITIVE_INFO privilege. -- Create the ACL HRACL. -- Create variables to store the data realm constraints and the column constraint. -- Create the column constraint. -- Create the data security policy. A data realm is a collection of one or more object instances. An object instance is associated with a single row in a table or view and is identified by the primary key value of the row in the storage table of the object. A table can have both static and dynamic data realms defined for it at the same time. As described earlier, an ACL defines the application privilege grants for the data realm. A data realm constraint is used to associate a data realm with an ACL. Example 5-2 creates a data realm constraint called realm_cons. The data realm constraint includes a membership rule to create a data realm. The data realm includes rows where DEPARTMENT_ID is 60 or 100. realm_cons also declares an ACL, called HRACL, to associate with the data realm. The membership of the object instances within a data realm is determined by a rule in the form of a SQL predicate, which must be applicable to the WHERE clause of a single-table query against the storage table of the object. The SQL predicate in Example 5-2 is DEPARTMENT_ID in (60, 100). If the SQL you write causes errors, such as ORA-28113: policy predicate has error, then you can use trace files to find cause of the error. See "Using Trace Files to Check for Policy Predicate Errors" for more information. Example 5-2 uses a single ACL called HRACL. A data realm can be associated with multiple ACLs, and the same ACL can be used across multiple data realms. A data realm comprised of one object instance, that is, one row. For example, you could use the WHERE predicate of ORDER_ID=2354. A data realm comprised of multiple object instances. For example, you could have multiple rows using the WHERE predicate of CUSTOMER_ID=104. A data realm comprised of the entire contents of the table, defined by the WHERE predicate of 1=1. Use valid SQL attributes such as columns in a table. Changes made to the data in the rows and columns are automatically reflected in the data collected by the data realm. Use parameters in the WHERE predicate. This example assumes that the parameter PARAM has been associated with different customer IDs. When you grant permissions in this situation, you need to grant the permission to the specific parameter value. You must specify the values of the parameters in the ACL associated with the data realm that contains this type of WHERE predicate. This enables you to create the grant based on customer IDs without having to create many customer ID-specific data realms. Use a membership rule based on runtime application session variables or subqueries. However, be careful about creating membership rules that are based on session variables or subqueries. For example, suppose you wanted to use the session variable USER, which reflects the current application user, in the membership rule col=USER. Oracle Database cannot pre-compute the resultant row set because the result is not deterministic. Application user SCOTT and application user JSMITH may have a different result for the same row. However, the membership rule col='SCOTT' works because the rule is always evaluated to the same result for any given row. See "About Using Static Data Realms" for more information about creating data realms. See also "XS_SYS_CONTEXT Function" for more information about XS_SYS_CONTEXT. In a static data realm, Oracle Database evaluates changes to data affected by a data realm when the data is updated. You can use static data realms with tables, but not with views. Materialized Views (MVs) will be used to maintain the binding between rows in the protected table and the ACLs that protect them. They will be generated automatically whenever static data realms are included in the data security policy. These MVs will support complete refresh only and will allow up to 125 ACLs to be associated with any single row. The MV that is generated will be of the form mv(TABLEROWID, ACLIDLIST) where TABLEROWID refers to a row in the table being protected and ACLIDLIST is a list of ACLID values stored in a RAW type column. The individual 16-byte values will be concatenated to form the list. Oracle Database evaluates dynamic data realms each time the application user performs a query on the data realm data. You can use dynamic data realms to protect rows for both tables and views. A dynamic data realm has the most flexibility, because it is not bound by the requirements needed for static data realms. Be aware that an overly complex rule within the dynamic data realm definition may affect performance. If the base table update is infrequent or the data realm member evaluation rule is complex, then you should consider using static data realms to protect the base table. A frequently updated base table may be constantly out of sync with the ACLIDS storage MV, unless the MV is refreshed accordingly. The administrator should make the decision based on the base table statistics and performance requirements of the system. If the SQL defined in the realm element causes an ORA-28113: policy predicate has error or similar message, then you can use trace files to find the cause of the error. The trace file shows the actual error, along with the VPD view showing the reason for the problem. Often, the syntax of the view has a trivial error, which you can solve by analyzing the SQL text of the view. To enable tracing, log into SQL*Plus as a user who has the ALTER SESSION privilege. "About Data Security (XSXDS and XSVPD) Event-Based Tracing"
By default, access to rows is protected by the ACL associated with the data realm. In addition, you can protect a particular column with custom application privileges. To protect a column for table T, add a list of column constraints to the data security policy that will be applied to table T.
For tables approaching 1000 columns, there is a limitation on the number of columns that can be protected as Real Application Security uses an internal virtual column to compute and store the authorization indicator. The sum of the number of columns and the number of protected columns should not exceed 1000. (Number of table columns + Number of protected table columns <=1000). For example, if a table has 998 columns, up to and including 2 protected columns are allowed; or, if a table has 990 columns, up to and including 10 protected columns are allowed, and so forth. If the number of columns to be protected exceeds the number allowed, an ORA-28113: policy predicate has error is returned. For example, the PRODUCT_INFORMATION table in the OE schema contains the LIST_PRICE column. If you want to restrict the display of product prices to specific categories, you can apply an additional application privilege to the LIST_COLUMN table, so that only the sales representative who has logged in can see the product list prices for the categories he or she manages. Example 5-3 shows a column constraint that protects the LIST_PRICE column with the ACCESS_PRICE application privilege. In these examples, the list price for product 3355 is NULL. To enable a mid-tier application to distinguish between the true value of authorized data, which could include NULL, and an unauthorized value that is always NULL, use the COLUMN_AUTH_INDICATOR SQL function to check if the column value in a row is authorized. You can mask the unauthorized data with a value different from NULL by modifying the SELECT statement to include a DECODE or CASE function that contains the COLUMN_AUTH_INDICATOR SQL function. Example 5-4 shows a SELECT statement that uses the COLUMN_AUTH_INDICATOR function to check authorized data and the DECODE function to replace NULL with the value restricted. Example 5-1 for an example of a column constraint element within a data security policy. The XS_DATA_SECURITY.APPLY_OBJECT_POLICY procedure applies a data security policy on a table or view. Use the XS_DATA_SECURITY.APPLY_OBJECT_POLICY procedure to enable Real Application Security for a database table or view. Example 5-5 enables the ORDERS_DS data security policy for the OE.ORDERS table. See "APPLY_OBJECT_POLICY Procedure" for more information. This section includes the following topic: About Applying Multiple Policies for a Table or View. You can apply multiple data security policies for a table or view. When a table or view is protected by multiple data security policies, an application user has access to only those rows that are allowed by all the policies. So, for example, if the data realm for Policy 1 includes a row, but the data realm for Policy 2 does not include the same row, the application user would be unable to access the row. Column security works similarly. Consider the case where column Col1 is protected by multiple policies: Policy1 protects it with Priv1, Policy2 protects it with Priv2, and so forth. Then an application user must have been granted all application privileges (Priv1, Priv2, and so forth) to access Col1.Thus, for columns protected by column policies, an application user must have been granted access by all policies protecting the column. The following table, OE.ORDERS, shown earlier under "About Understanding the Structure of a Data Realm", has been enabled with XS_DATA_SECURITY.APPLY_OBJECT_POLICY. It shows the addition of the hidden SYS_ACLOID column. This column, whose data type is NUMBER, lists application user-managed ACL identifiers. The following table contains the application user-managed ACL identifier 500, which is a direct grant on the object instance identified by the order ID 2356. The SYS_ACLOID hidden column can be enabled by passing the value XS_DATA_SECURITY.APPLY_ACLOID_COLUMN for the apply_option parameter when invoking the XS_DATA_SECURITY procedure. Real Application Security allows only one ACLID to be added to the SYS_ACLOID column. The system-managed static ACL identifiers, are stored in a Materialized View (MV). To find detailed information on the data realms or data realm constraints associated with a table, query the DBA_XS_REALM_CONSTRAINTS data dictionary view. See "DBA_XS_REALM_CONSTRAINTS" for more information. The ACLs from grants directly on object instances (that is, application user-managed ACL identifiers) are evaluated first. See "About Configuring Access Control Lists" for more information about creating an ACL and adding it to the object instance. The ACLs from static data realm constraint grants are evaluated next, after application user-managed ACLs. If you have multiple static data realms, they are evaluated in the order of their physical appearance in the data security policy. See "About Using Static Data Realms" for more information about static data realms. The ACLs from dynamic data realm constraint grants are evaluated last. If you have multiple dynamic data realms, they are evaluated in the order of their physical appearance in the policy. See "About Using Static Data Realms" for more information about dynamic data realms. For more information about master-detail tables, see the chapter about creating a master-detail application using JPA and Oracle ADF in Oracle Database 2 Day + Java Developer's Guide . You can create a data security policy that can be used for master-detail related tables. Typically, you may want the same policy that protects the master table to protect its detail tables. Creating a Real Application Security policy for master-detail tables enables anyone accessing these tables to do so under a uniform policy that can be inherited from master table to detail table. Multiple detail tables can inherit policies from one master table. Detail tables can inherit policies from other detail tables. One detail table can inherit policies from multiple master tables. If any one of the policies in the master table is satisfied, then application users can access the corresponding rows in the detail table. To create a Real Application Security policy for master-detail related tables, you must create a data security policy for each table. In each data security policy for the detail tables, you indicate the master table from which the detail table inherits by including master detail data realms. Steps 4, 6 and 7 in the procedure under "Example of Creating a Real Application Security Policy on Master-Detail Related Tables" shows examples of creating and using master-detail data realms and creating and applying master-detail data security policies to master-detail tables. Example 5-6 shows a sample master detail data realm. when_condition specifies a predicate for the detail table, similar to a WHERE clause, to filter data. If when_condition evaluates to true, then Oracle Database applies the master policy. This element is optional. parent_schema specifies the name of the schema that contains the master table. parent_object specifies the name of the master table. primary_key specifies the primary key from the master table. foreign_key specifies the foreign key of the detail table. This example uses the SH sample schema. The SH schema has a table called CUSTOMERS, which is the master table. The master table CUSTOMERS has a detail table called SALES, and another detail table called COUNTRIES. The following example demonstrates how to enforce a Real Application Security policy that virtually partitions the customer and sales data along their regional boundary defined in the COUNTRIES table for read access of the CUSTOMERS and SALES tables. In addition, there is a requirement to mask out data on the columns CUST_INCOME_LEVEL and CUST_CREDIT_LIMIT to users, except for those users who need full table access for business analysis, such as the business analyst. All administrative commands in this example can be performed by a database user, such as the SYSTEM account who has the DBA roles in the database, because the DBA role has been granted appropriate privilege for Real Application Security administrative tasks. In addition, because security classes, ACLs, and data security policies are schema qualified objects, you must explicitly use the intended schema name when these objects are specified in the APIs, so they will not be resolved to objects under the database session default schema of SYSTEM. -- SH.CUSTOMERS in the master table. -- SH.SALES is a detail table. -- SH.COUNTRIES is a detail table. Figure 5-2 shows an overview of the completed Real Application Security data security policies created and applied to the master-detail related tables (CUSTOMERS - SALES - COUNTRIES) that are described as an overview in the following steps and in more detail in the steps that follow this figure. Create the principals, an application role and an application user, for each of four geographic regions: Europe, Americas, Asia, and Africa, in addition to a business analyst role and an associated application user. Create the VIEW_SENSITIVE_INFO privilege and create the SH.CUST_SEC_CLASS in which to scope the privilege. Grant the VIEW_SENSITIVE_INFO privilege to the business analyst role. Define a data realm constraint with a rule that parameterizes regions in order for the system to recognize the string &REGION, which will later be used in a policy. Create a column constraint to secure the two columns, CUST_INCOME_LEVEL and CUST_CREDIT_LEVEL using the VIEW_SENSITIVE_INFO privilege. Create the data security policy SH.CUSTOMER_DS specifying the data realm constraint and the column constraint that was previously created. Register the name and data type of the parameter in the rule for the SH.CUSTOMER_DS data security policy. Create the ACLs for each region to authorize read access to the respective roles needing read access. For example for the Europe region, you grant SELECT privilege to the Europe_sales role and grant SELECT and VIEW_SENSITIVE_INFO privileges to the Business_Analyst role. Associate each ACL in each region with the rows that satisfy the rule where the value of the parameter REGION is equal to region name, for example, Europe. You do this for each of the four regions, and then add this ACL to the SH.CUSTOMER_DS data security policy. Create the data realm constraint for the master-detail tables, so users can access a record in the SALES detail table only if a user is authorized to access its parent row in the CUSTOMERS master table. Create the SH.SALES_DS data security policy to enforce this data realm constraint. In Figure 5-2, the master-detail tables also show the primary key (PK) fields and foreign key (FK) fields and a number of additional fields that are used in creating the data realm constraints and column constraints. Using these PK and FK relationships, the same data security policies that apply to the master table also apply to the detail tables. In this particular case, for example, all ACLs granting SELECT privilege to the CUSTOMERS master table and enforced by the SH.CUSTOMER_DS data security policy, also applies to the SALES detail table. Description of "Figure 5-2 Real Application Security Data Security Policy Created on Master-Detail Related Tables"
Create the roles and users needed for each country, (role Europe_sales, user SMITH), (role Americas_sales, user JAMES), (role Asia_sales, user MILLER), (role Africa_sales, user MARTIN), and (role Business_Analyst, user TURNER), who is the only user who will have full table access. Define the SH.CUST_SEC_CLASS security class for the privilege, VIEW_SENSITIVE_INFO to protect the sensitive columns. The row level privileges to access data security protected objects for query and DML are predefined in the Security Class DML under the SYS schema. Define the data realm constraint with a rule that parameterizes regions, then define the column constraint and specify the name of the two columns, CUST_INCOME_LEVEL and CUST_CREDIT_LIMIT, to be secured by the VIEW_SENSITIVE_INFO privilege. Then, create a SH.CUSTOMER_DS data security policy and register the name and data type of the parameter in the rule. The security policy requires that regional customers and sales data be partitioned with different ACLs. One way to achieve this is to define as many data realms as regions and do this for both tables. However, in this example, another way is shown. That is, to parameterize the region in a data realm with a single rule and use the master-detail relationship to simplify the administrative tasks. In order for the system to recognize that the string &REGION in the rule is indeed a parameter, you must invoke the xs_data_security.create_acl_parameter procedure to register the parameter name after the policy is created. In addition, you must specify the data type of the parameter value. Since regions are stored as character string data, the XS_ACL.TYPE_VARCHAR macro is used for this example. Another supported data type is XS_ACL.TYPE_NUMBER for numbers. -- Define the realm constraint with a rule that parameterizes regions. -- CUST_CREDIT_LIMIT columns by using the VIEW_SENSITIVE_INFO privilege. -- Register the name and data type of the parameter in the rule. Create ACLs to authorize read access for each region. For the Europe region, grant SELECT to the Europe_sales role. In addition, SELECT and VIEW_SENSITIVE_INFO privileges are granted to the Business_Analyst role so that the grantee of the role has full table access and is able to see data in the columns of CUST_INCOME_LEVEL and CUST_CREDIT_LIMIT as well. --  (select COUNTRY_ID from SH.COUNTRIES where COUNTRY_REGION = 'Europe'). Create ACLs to authorize read access for the other three regions, Americas, Asia, and Africa. Apply the SH.CUSTOMER_DS policy created in Step 3 to protect read access to the CUSTOMERS table. Create the data realm master-detail constraint to protect the SALES table. This master-detail constraint utilizes the same regional partitioning policy as previously described in Steps 3 through 6. This means that a user can access a record in the SALES detail table only if that user is authorized to access its parent row in the CUSTOMERS master table. -- Define the master-detail constraint. -- Create a policy to enforce the constraint. -- Apply the policy to protect read access of the SALES table. Grant object level SELECT privilege to PUBLIC for users to perform a query. Connect as user MARTIN and perform a query to display user MARTIN's sales data for the Africa region and to show the masking of the sensitive sales information for the CUST_INCOME_LEVEL and CUST_CREDIT_LIMIT columns. The owner of the object to which the policy is applied. If the data security policy is applied to an object with the owner bypass specification, the owner of the object may bypass such policy. By default, owner bypass is not allowed. The object owner also can create another view on the same table and assign this view a different Real Application Security policy. The SQL*Plus SET SECUREDCOL command enables you to customize how secure column values are displayed in SQL*Plus output for users without permission to view a column and for columns with unknown security. You can choose either the default text or specify the text that is displayed. The default is OFF. When column level security is enabled, and SET SECUREDCOL is set ON, output from SQL*Plus for secured columns or columns of unknown security level is replaced with either your customized text or the default indicators. This only applies to scalar data types. Complex object data output is not affected. Displays the default indicator asterisks (****) in place of column values for users without authorization to view the column, and displays question marks (?????) in place of column values where the security level is unknown for the column (when the specific privileges applied to the column are not known). The indicators "*" and "?" are filled to the defined column length or the column length defined by a current COLUMN command. By default this command will be OFF. Displays null values in place of column values for application users without authorization to view the column, and in place of column values where the security level is unknown for the column. Text enables you to specify the text to be displayed in a secured column for application users without authorization to view the column. This text appears instead of the default *****. You can specify any alphanumeric text up to the column length or a maximum of 30 characters. Longer text is truncated. Text containing spaces must be quoted. Text enables you to specify the text to be displayed in a column of unknown security level (when the specific privileges applied to the column are not known). This text appears instead of the default ??????. Traditionally, views in Oracle Database use definer's rights. This means that if you invoke an identity or privilege-sensitive SQL function or an invoker's rights PL/SQL or Java function, then current schema, and current user, are set to the view owner and currently enabled roles is set to the view owner plus PUBLIC within the functions's execution. If you need background information on invoker's rights and definer's rights, see Oracle Database PL/SQL Language Reference . Certain built-in SQL functions, such as SYS_CONTEXT() and USERENV() are exceptions to the preceding rule. These functions always use the current application user's environment, even when called from definer's rights views. Oracle Database 12c Release 1 (12.1) and later enables you to create views with the BEQUEATH clause, which lets you configure this behavior. The BEQUEATH clause determines whether identity or privilege-sensitive SQL functions, invoker's rights PL/SQL program units, and Java functions referenced in the view inherit the current schema, current user, and currently enabled roles from the querying user's environment. This is especially useful for Real Application Security applications, which often need to run code in the invoking application user's environment. Using BEQUEATH CURRENT_USER in the view definition creates a view that allows privilege-sensitive, and invoker's rights functions referenced in the view to inherit current schema, current user, and currently enabled roles from the querying user's environment. See Oracle Database SQL Language Reference for the syntax of the CREATE OR REPLACE VIEW statement. Example 5-7 illustrates how a BEQUEATH CURRENT_USER view enables invoker right's program units to run in the invoking application user's environment. When USER2 selects from USER1's view, the invoker's rights function is invoked in USER2's environment. Using BEQUEATH DEFINER in the view definition creates a view that causes privilege-sensitive, and invoker's rights functions referenced in the view to inherit current schema, current user, and currently enabled roles from the view definer's environment. If no BEQUEATH clause is specified, then BEQUEATH DEFINER is assumed. If a BEQUEATH_DEFINER view contains a reference to a BEQUEATH CURRENT_USER view, then invoker's rights functions in the referenced view would use the parent view owner's rights. Example 5-8 illustrates how a BEQUEATH DEFINER view defines a boundary for nested invoker right's program units to run in the view owner's environment. When USER2 selects from USER1's view, the view's invoker's rights function is invoked in USER1's environment. SQL> -- You first create an invoker's rights function to determine who the current SQL> -- user really is. SQL> -- the references present in the view body using definer's rights. This section includes the following topic: Using SQL Functions to Determine the Invoking Application User. SQL functions, such as SYS_CONTEXT() and USERENV(), and XS_SYS_CONTEXT(), always return the current application user's environment, even when called from definer's rights views. Sometimes, applications need to determine the invoking application user based on the security context (BEQUEATH property) of views referenced in the statement. ORA_INVOKING_USER: Use this function to return the name of the database user whose context is currently used. If the function is invoked from within a definer's rights boundary, then the name of the database object owner is returned. If the invoking user is a Real Application Security application user, then the constant XS$USER is returned. ORA_INVOKING_USERID: Use this function to return the identifier (ID) of the database user whose context is currently used. If the function is invoked from within a definer's rights boundary, then the ID of the database object owner is returned. If the invoking user is a Real Application Security application user, then the function returns an identifier common to all Real Application Security application users, but distinct from the identifier for any database user. ORA_INVOKING_XS_USER: Use this function to return the name of the Real Application Security application user whose context is currently used. If the invoking user is a database user, then the value NULL is returned. ORA_INVOKING_XS_USER_GUID: Use this function to return the identifier (ID) of the Real Application Security application user whose context is currently used. The following example shows a database user USER1 querying ORA_INVOKING_USER and ORA_INVOKING_XS_USER. ORA_INVOKING_XS_USER returns NULL, as the user is not a Real Application security application user. This section puts all the Real Application Security concepts together in order to define a basic data security policy. It builds upon the HR scenario example introduced in "Scenario: Security Human Resources (HR) Demonstration of Employee Information". The section includes the following topic that discusses each implementation task described in the scenario with the help of an example. Before you can create Real Application Security components, you must first create a database user as the Real Application Security Administrator, grant this administrator dba and xs_session_admin privileges, and then connect to the database as the Real Application Security Administrator. Create the database role DB_EMP and grant this role the necessary table privileges. This role is used to grant the required object privileges to application users. Grant the DB_EMP database role to the three application roles, so they each have the required object privilege to access the table. Create application user DAUSTIN (in the IT department) and grant this user application roles EMP_ROLE and IT_ROLE. Create application user SMAVRIS (in the HR department) and grant this user application roles EMP_ROLE and HR_ROLE. Create a security class HRPRIVS based on the predefined DML security class. HRPRIVS has a new privilege VIEW_SALARY, which controls access to the SALARY column. Create three ACLs, EMP_ACL, IT_ACL, and HR_ACL to grant privileges for the data security policy to be defined later. Lines 11 through 13: Creates the EMP_ACL and grants EMP_ROLE the SELECT and VIEW_SALARY privileges. Lines 21 through 23: Creates the IT_ACL and grants IT_ROLE the SELECT privileges. Lines 30 through 32: Creates the HR_ACL and grants HR_ROLE the ALL privileges. The ALL privilege means all the privileges in the ACL's security class. In this case, ALL privileges includes SELECT, INSERT, UPDATE, and DELETE database privileges to view and update all employee's records, and granting the VIEW_SALARY application privilege to view the SALARY column. 7    --          own record including SALARY column. 17    --          privilege that is required for access to SALARY column. 26    --          employees' records including SALARY column. Create the data security policy for the EMPLOYEES table. The policy defines three data realm constraints and a column constraint that protects the SALARY column. Lines 7 through 23: Defines the three data realm constraints. Lines 27 through 30: Defines the column constraint requiring the VIEW_SALARY application privilege to view the SALARY column. Lines 32 through 35: Creates the EMPLOYEES_DS data security policy encompassing the three data realm constraints and the column constraint. Apply the data security policy to the EMPLOYEES table. 7    -- Realm #1: Only the employee's own record. 8    --           EMP_ROLE can view the realm including SALARY column. 13    -- Realm #2: The records in the IT department. 14    --           IT_ROLE can view the realm excluding SALARY column. 19    -- Realm #3: All the records. 20    --           HR_ROLE can view and update the realm including SALARY column. After you create these Real Application Security objects, validate them to ensure they are all properly configured. SQL> -- XS$VALIDATION_TABLE contains validation errors if any. SQL> -- Expect no rows selected. Example 5-22 shows the complementary operation of disabling data security for table HR.EMPLOYEES. Using direct logon first as application user DAUSTIN and later as application user SMAVRIS. In each case, each user performs queries on the HR.EMPLOYEES table to demonstrate what each can access or cannot access to view employee records and the SALARY column. See "Running the Security HR Demo Using Direct Logon" for a description of this demonstration. In this demonstration, the Real Application Security Administrator creates a Real Application Security session for an application user to attach to. See "Running the Security HR Demo Attached to a Real Application Security Session" for a description of this demonstration.